Posteroute is dedicated and committed to providing and delivering quality training. All of our courses are mapped to DANOS (Drug and Alcohol National Occupational Standards). Which are part of the National Treatment Agencies Workforce Development Plan. This Introduction to Substance Misuse Awareness is aimed at anyone interested in gaining more knowledge, affected by or working across a variety of sectors, such as social care, security, criminal justice, education, counselling, the health sector, sport and recreation or community work, looking for an introductory level in substance misuse. Are you interested in changing your career? 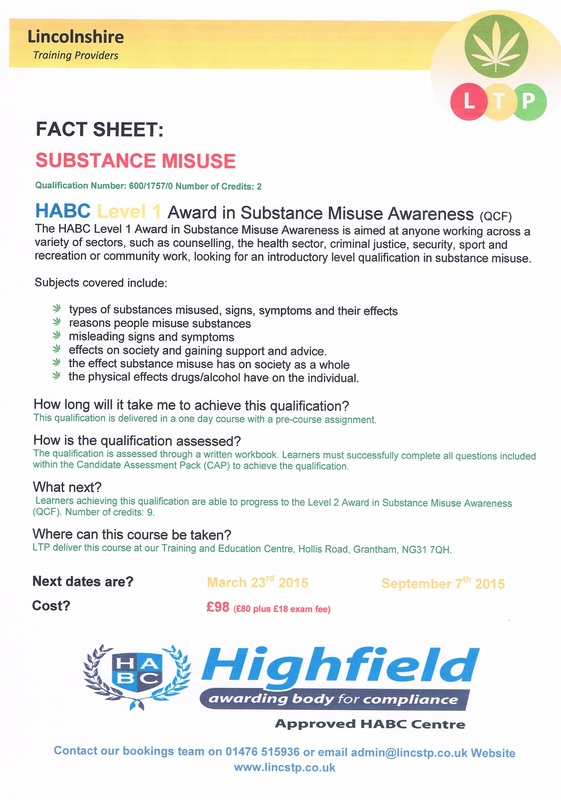 Would a qualification in Substance Misuse be helpful to your future or current employment? Are you and Employer who would like to support your staff to work more effectively with substance users or their families? Posteroute recognise how important Continuous Professional Development (CPD) is to your staff. but a qualification in the subject gives your staff the knowledge both to use in the work place with confidence and identifies a competent, qualified and a professional work force. Develop of your staff team and a qualification shows a commitment both to staff and CPD targets. Posteroute offers the HABC Level 1 Award in Substance Misuse Awareness (QCF) in just ONE day with a little guided pre-course preparation GLH: 13. External delivery will incur the full cost of £125 due to additional administration and expenses. For more details contact bookings on 01476 515936. This level two course GLH are 67 usually delivered over 12 weeks, this includes 3 hours tutoring and up to 5 hours homework or 1 day per week for 6 weeks. This in-depth course it is aimed at anyone working across a variety of sectors, such as counselling, the health sector, sport and recreation or community work, looking for an intermediate level qualification in substance misuse. Our staff have delivered the level 2 course for over 7 years and have a fantastic reputation for their quality and knowledge. This accredited qualification is for anyone working in a variety of sectors requiring a level 2 qualification in substance misuse. Subjects covered include substance use/misuse, recognition and response to substance use/misuse, community responses to substance misuse, options and interventions for those affected by substance use/misuse, substance misuse and young people. A group of 10 discounted rate of £2700 giving you one free place, amazing value for qualified staff. Both courses can be delivered in our own training suite or in-house.